Celery, paprika, garlic in a rib rub equals sweet, spicy heaven on a bone! We seasoned our ribs with the Powderpuff BBQ team’s rib rub recipe, braised them in the oven with a Cider Squirt basting sauce, and finished them off with Bone Suckin’ BBQ sauce. 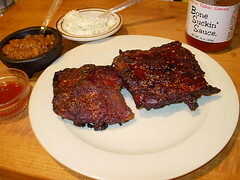 The Bone Suckin’ Sauce is very thin, so it’s a great finishing glaze. These are the *best* ribs we’ve ever cooked, bar none!! Apparently, the team’s founder and pit master, Janeyce Michel-Cupito, has temporarily retired. In 1993, Powderpuff won first place in the KC Royal rib competition for these smoky, mahogany-colored ribs. This is all the more remarkable because Janeyce served them Memphis-style (dry) in a city that loves a sweet, sticky barbecue sauce. good and different. After tasting the original recipe, I decided I wanted a hit of dry mustard, and so added 2 Tbs to it. Makes 1 cup rub – enough for 4lbs of ribs. Combine all ingredients is saucepan, and bring to a boil. Reduce heat and simmer for 5 minutes. Let cool, and place in spray bottle, or bowl to spray or brush on ribs every 30 minutes or so. Keeps for 1 or 2 days. We rubbed 2 racks of baby-back ribs with the Powderpuff Rub, and let them get happy in the fridge for an hour or so. Wrapping each rack in foil, we poured in about 1/4 cup of the Cider Squirt into each packet. Placed the ribs into a 350 degree oven** for about 2 hours – you want to see some of the meat pulling back from the bone at this point. Get those ribs out of the oven, take them out of the foil, and place ’em on indirect heat on your grill. After 30 mins on the grill, spray them with the Cider Squirt and turn them over for another 30 min. Okay, time to turn them over again, and squirt them again. After an hour on the grill, they’re begging for some sauce, so brush them with the Bone Suckin’ or whatever your favorite bbq sauce is, for the last 15 minutes of their life on the grill. Bring these puppies in, and serve with your favorite sides and enjoy! ** – Raichlen would *never* agree to starting ribs in the oven – he’d make me eat a bag of McRib sandwiches first! Sorry Steve, it’s Winter in Maryland!